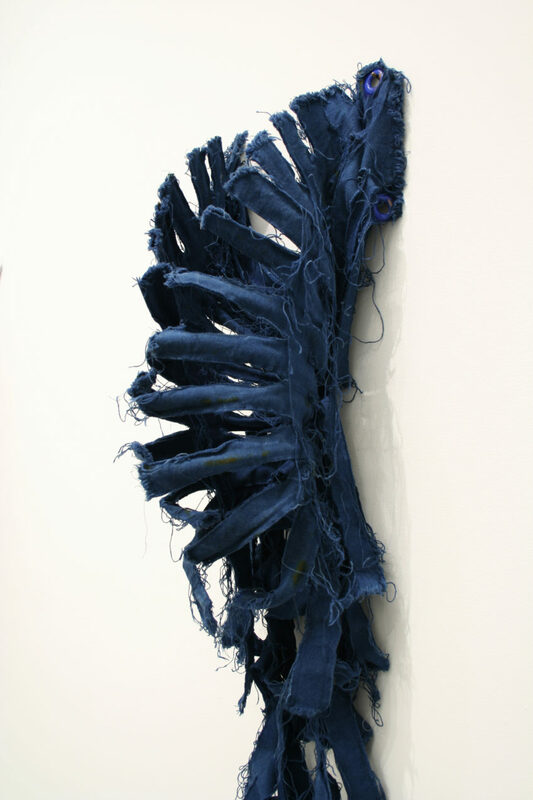 This January, Klaus von Nichtssagend will show three new sculptural works by Joy Curtis in the front gallery. 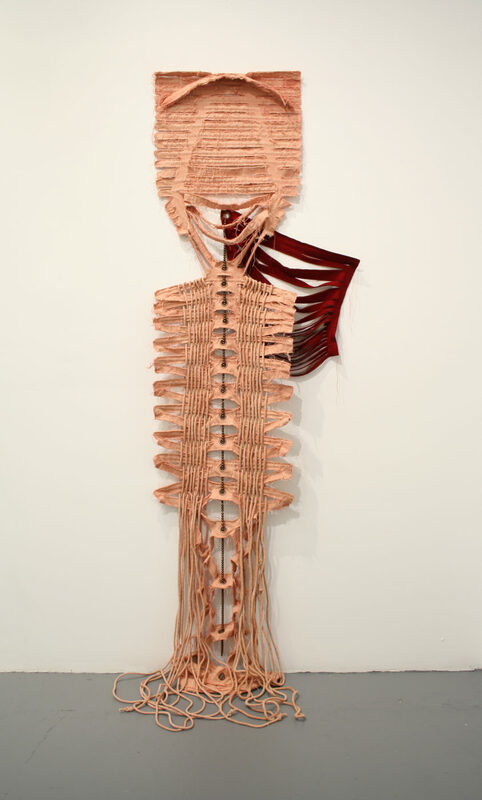 Curtis uses hand-dyed fabrics inlaid with wire supports to create cavity-like forms alluding to bodies, skeletons, or armor. Their forms extend down from the walls to the floor in long strands. 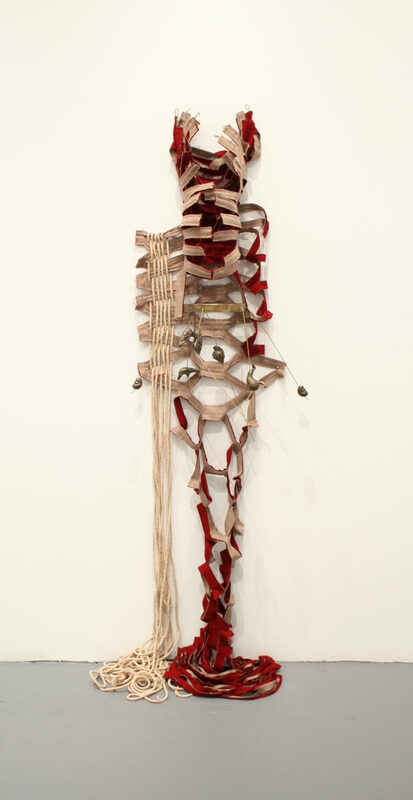 Within some of the fabric forms, bronze-cast objects hang suspended like talismans or organs. 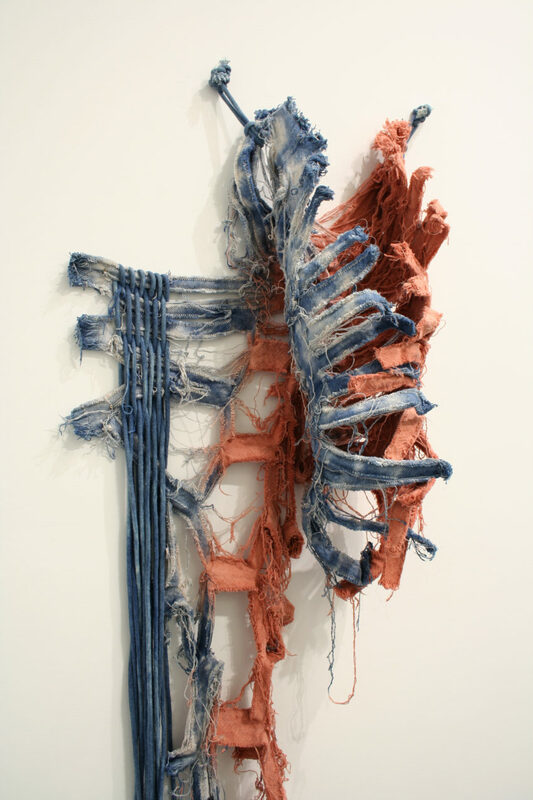 Curtis’s work is informed by her studies of natural and synthetic dyes, and the historical and social implications associated with them. 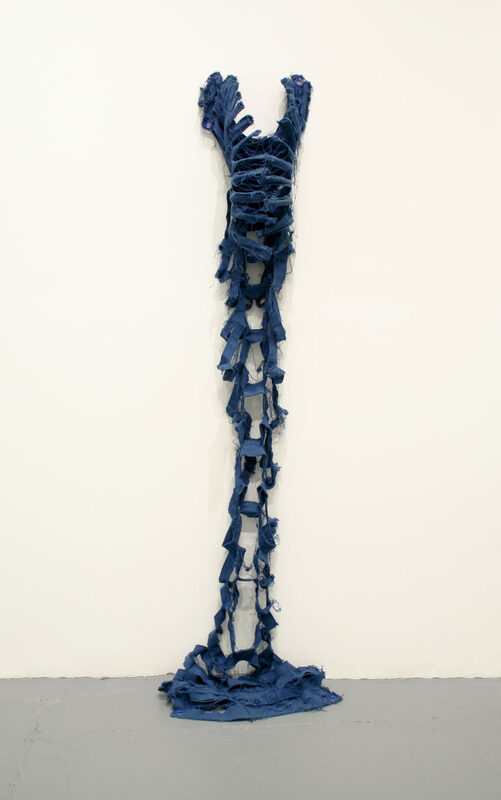 The pieces in this show are made with indigo and madder root dyes, which played a role in the African slave trade. Indigo is used in North and West African, South American and Indian cultures, while salmon and beige-toned madder root is native to many parts of Europe and the Middle East. Both were grown under colonial powers and are deeply tied to the commodification of agriculture and human bodies within mercantile economies. 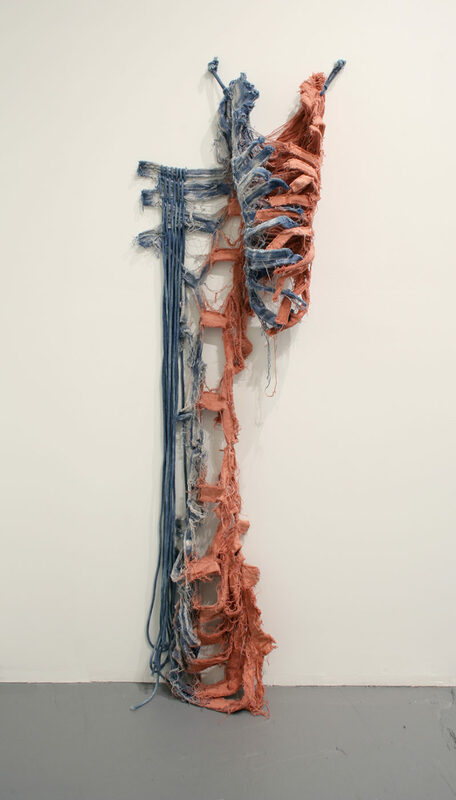 In one instance Curtis uses synthetically dyed fabric to represent inner body muscles, tendons, and ligaments. The invention of synthetic dyes, while challenging ecosystems, was instrumental in ending slave labor and other abusive labor practices globally. 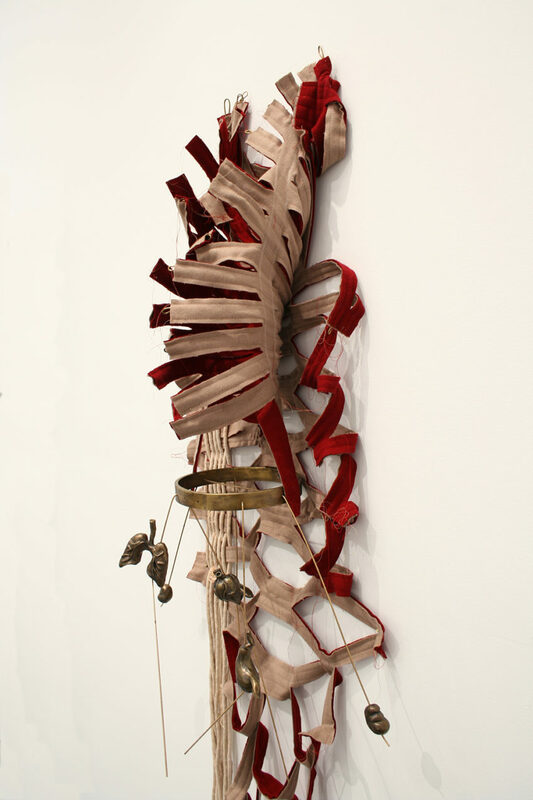 Curtis’s sculptures look to vocabularies of anthropology and color to examine histories and past abuses. Through this work she hopes to foster some of the awareness and attention that healing requires.